Most romantic movies shout from the rooftop that they are a ‘different love story,’ but only Nagraj Manjule makes you realise what the difference is with his ‘Sairat’. If his first movie ‘Fandry’ spoke about the caste system with a school boy following his unrequited love, his second movie leaps way beyond expectations in this seemingly simple love story with unexpected twists, unprecedented in the Indian film industry. While the first half is nearly 2 hours long, it is an entertaining romance between the brave yet docile Parshya and the ‘pretty tomboy’ Archie interspersed with hummable yet repetitive tunes from Ajay- Atul. It was refreshing to see audience dancing in the aisles to ‘Yed Lagale’. Though ‘ Ki and Ka’ was branded as a role reversal comedy, Manjule brings out this contrast in a highly effective and unassuming manner in the natural surroundings of a small village in Maharastra. The unconventional lead pair with their smartass friends set a conventional background for a caste- conflicted love story between the rich and poor. While most marathi filmmakers set their story in rural India, it is Manjule’s experience and upbringing in the ‘low caste’ community of Maharastra that sets this movie apart. The cinematography makes rural Maharashtra look like a tourist paradise and highlights the raw appeal of its actors. The characters are real and speak in an unadulterated rural dialect. The actors are facing the camera for the first time, yet the director brings out the best in them. It is refreshing to see the lead actress ride a Bullet in a village to make a statement- much different than that of Katrina riding it in ZNMD. She is the Marathi answer to the unconventional Bhumi Pednekar in ‘DLKH’- Caring like a woman to her love, yet manly when she has to protect him; even if that means wielding a gun. Besides, when was the last time you heard a lead actress take the initiative to say ‘ I love you’ to the hero? No powder puffed actors, but power packed characters! The second half appears mundane with the reality of a love story. Again the typical harsh realities a couple in love has to face once their honeymoon period is over. And this is the craft of the story teller- Nagraj Manjule. Just when you are lulled in to the feeling of the conventional- it is like floating on a docile stream before you are hurled down an unseen waterfalls- he brings about an absolute cinematic end that only showcases the power of silence and keeps you spellbound for hours after the movie. If the first half is Bollywood masala, then the second half is ‘Godfather’. The Indian film industry seems to have found a filmmaker who not only can tell his story convincingly, but can also speak the language of the internationally acclaimed filmmakers with ‘Silence’ as his biggest weapon. 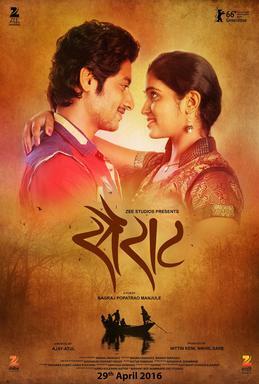 If you miss this movie, you would be missing an important part of the renaissance of the Marathi Film industry! How is the second half ‘Godfather’?